A very thin flat cake, similar to a pancake, that is served as a base for a variety of sweet toppings or as a food wrap to be filled with rich and savory ingredients rolled inside the crêpe. A typical recipe for crêpe batter will combine flour with egg yolks or whole eggs, and milk or cream. A crêpe can be made as a sweet or a savory crêpe, depending on the ingredients in the recipe. 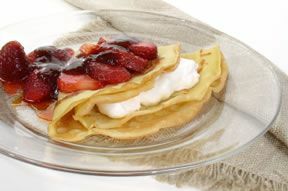 Sweet crepes have sugar and other flavorings that provide a sweet taste to the crêpe batter. 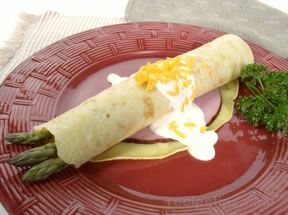 Savory crêpes do not have sweeteners, thus they have a more mild taste that does not overpower the added meats and cheeses rolled or folded into the crêpe when it is served. Crêpes that are to be rolled and filled with ingredients should be cooked on only one side. However, it is generally personal preference if prepared well, since a Crêpe cooked on one side or both sides can still be rolled. Cooking only one side of the Crêpe allows for a more moist and tender surface on one side and a more crisp and golden brown colored surface on the other. 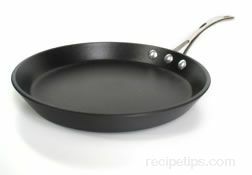 Special pans, either flat bottom or rounded bottom, are designed for making crêpes, but a small heavy skillet can also be used if the surface is clean, very smooth and well seasoned. The pan is heated to a hot temperature, then allowed to cool to a medium temperature before the batter is added. If a flat bottom pan is used, add the batter and then quickly move it around the pan to evenly distribute it across the surface. Within 30 seconds the crepe has browned and most likely is ready to be flipped over to heat the other side for only a few seconds. The key to making good crêpes is to become accustomed to pouring, swirling or coating the batter evenly onto the surface of a heated pan. Using approximately an ounce and a half (1-1/2 oz.) of batter will provide a crêpe that is approximately 1/10th of an inch (2.5 mm) thick.